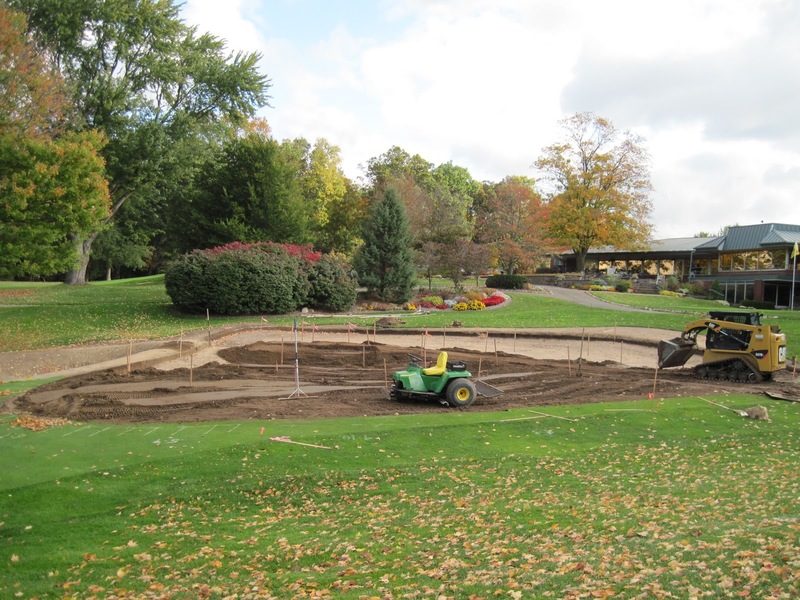 Now that the renovation of #18 green has been completed, there are many steps that remain to make the green playable. 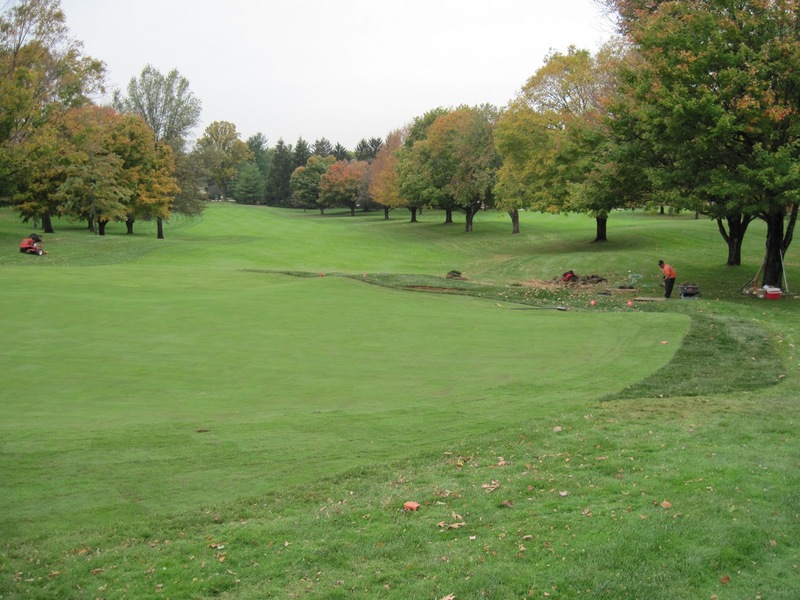 During the next few weeks, you will see us performing several different cultural practices in an effort to help the green become as healthy as possible as we head into the winter. What we do now also has a profound imapct on how quickly we can get the green playable in the spring. The green will be topdressed regulary to help smooth the playing surface and to protect the plant as we head into the winter months. 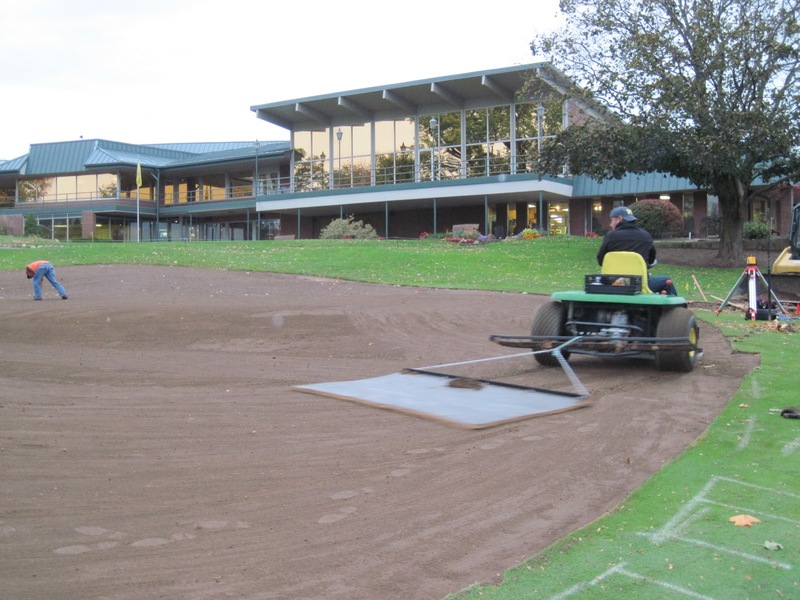 The green has already been fertilized to promote growth and maturation and will likely be fertilized at least one more time to promote nutrient and carbohydrate storage for the winter months. 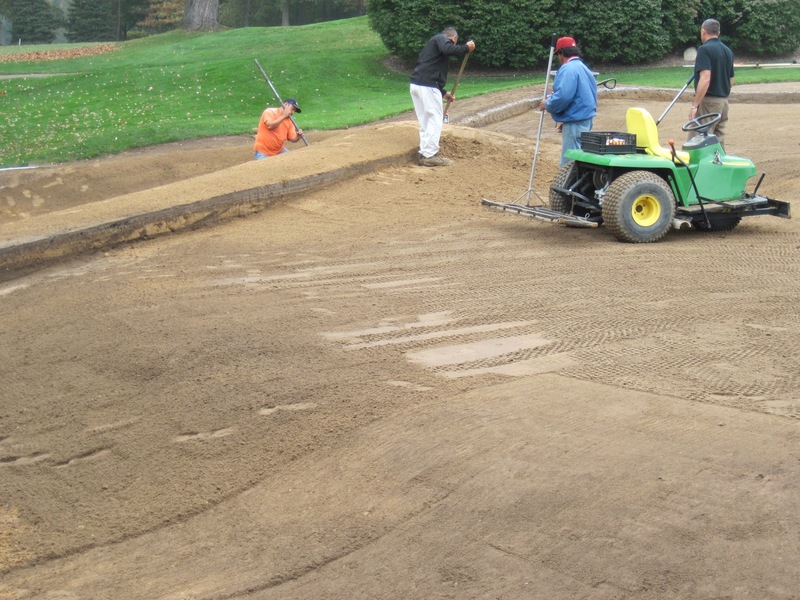 Ideally, I would like to deep-tine the green with solid tines to a depth of about 12″ to help even out the playing surface and create additional channels for roots to grow sometime this fall but the sod will need to be established before this occurs. In the spring, the green will continue to be topdressed regulary as well as be aerified numerous times with both solid and hollow tines. 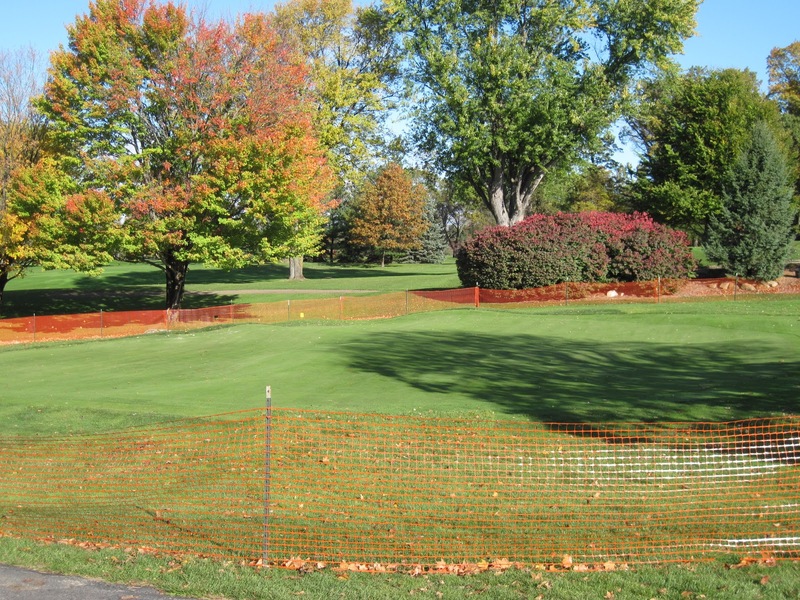 It is hard not to notice the bright orange fence surrounding the green. This is there for obvious reasons. 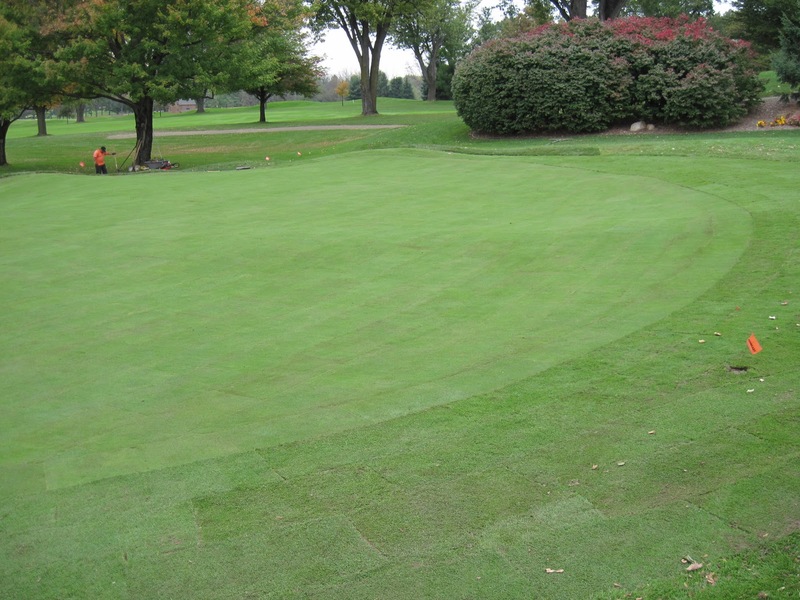 Excess traffic leads to excess wear-and-tear, especially on new sod. Because of the popularity of this project and the fact that it is being viewed as the shiny new present that everyone want to play with, I have elected to put a fence around the entire green and surrounding area to minimize traffic and unnecessary stresses. Please stay outside the fence. 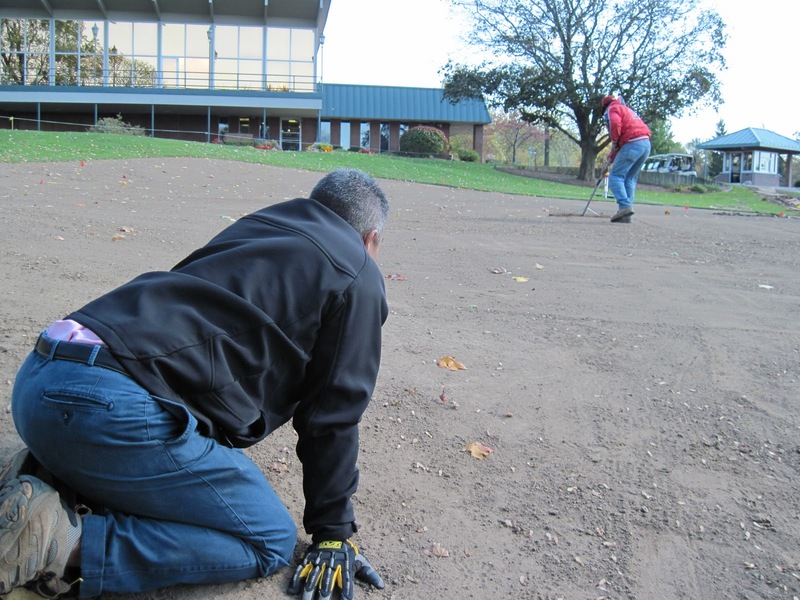 Adhering to this simple request will pay dividends next spring when it comes time to open the green for play. At this point it is far to early to estimate when the green will be open for play. Rest assured that it will be opened as soon as possible, but only when the time is right. After two very long days of working to get our renovation project done before the rains came, I am happy to report that the renovation of #18 green is now complete. 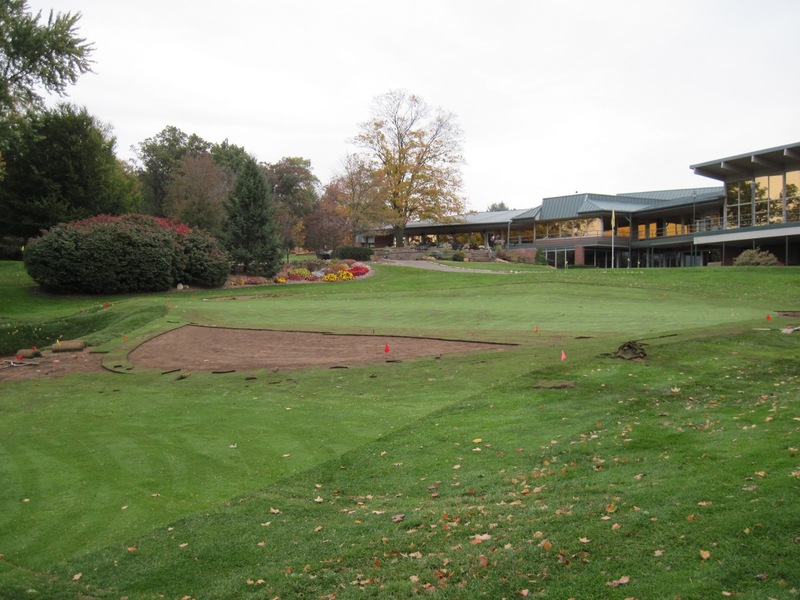 The comments from the membership regardingthe size, shape and contouring of the new green have been nothing but positive. 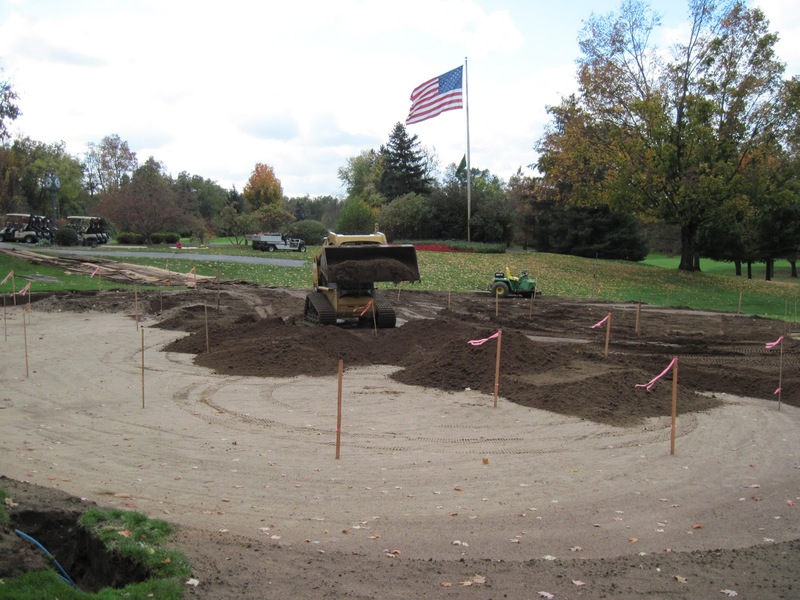 It will undoubtedly provide a significant challenge at the completion of every round played here at Elcona Country Club. Ramon and his staff from O&J Construction as well as Mr. Arthur Hills and his associate Brian Yoder have been true professionals to work with and every day of the project has been completed without any major setbacks or surprises. 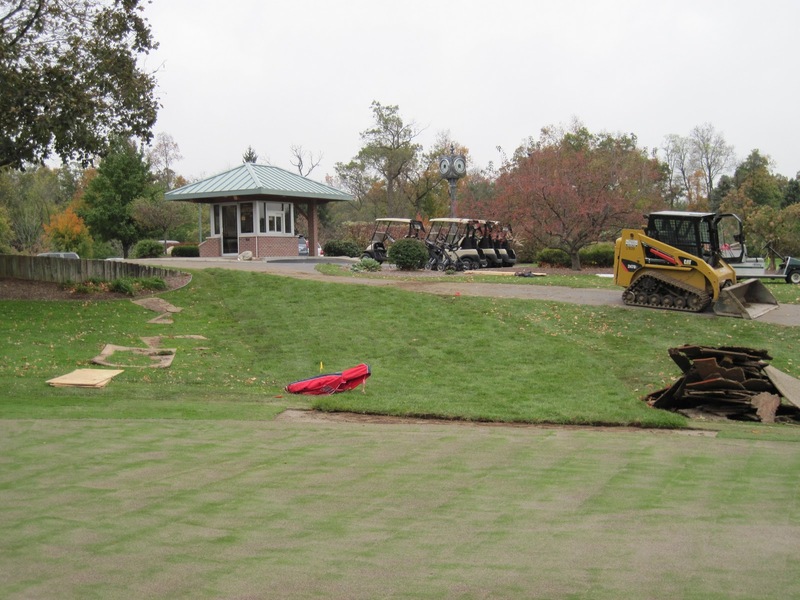 The final day of the project was spent finishing the sod on the green, the collar mow-out and around the new bunker. 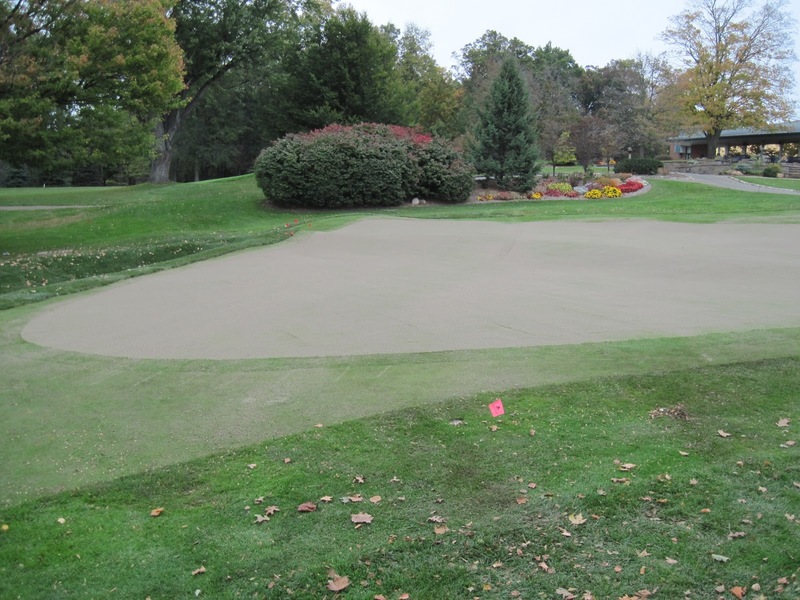 After the sod on the green was finished, it was cleaned, rolled and topdressed. The haul road leading from the cartpath was cleaned-up and sodded as well. 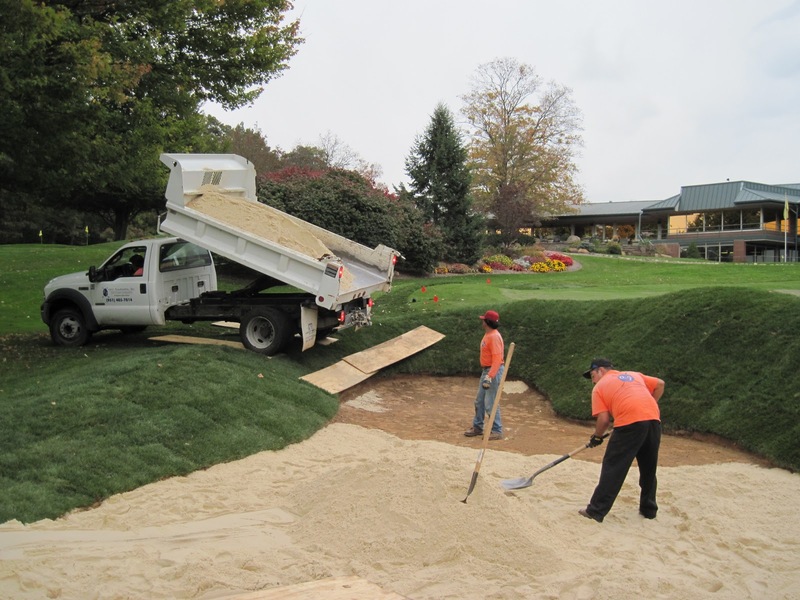 The last step of the day was to add the new bunker sand and to clean-up any remaining debris around the worksite. Please watch for future updates that will describe our agronomic practices to the green for the remainder of the year and into next spring. Click on pictures for a larger view. The back of the green. Completed green looking toward the fairway. Major progress today. 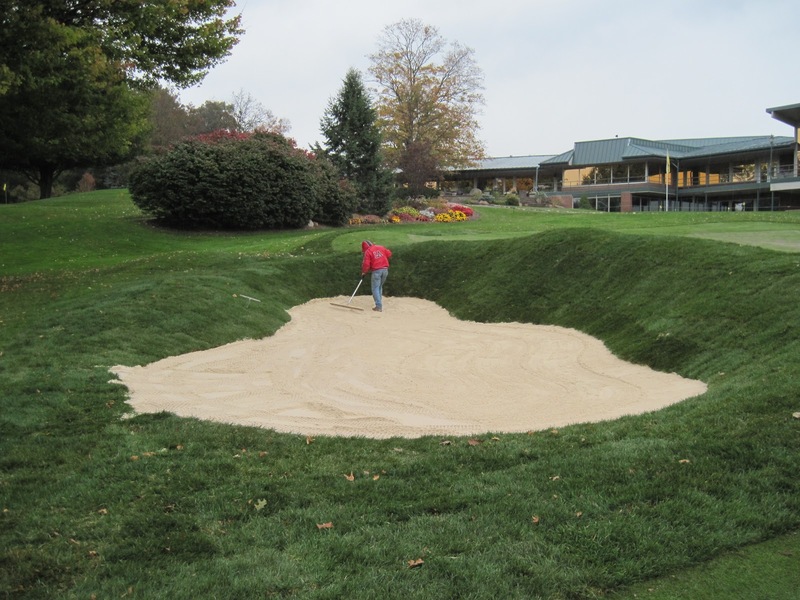 After an unannounced, but welcomed visit by Mr. Arthur Hills on Sunday, we had a few more minor adjustments to make to the green. 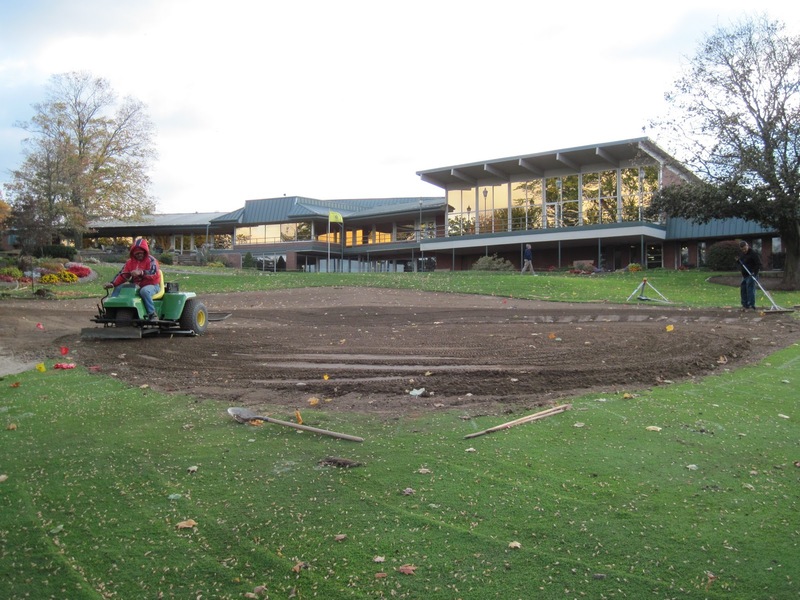 After the adjustments were made, it was finally time for some sod to go down. 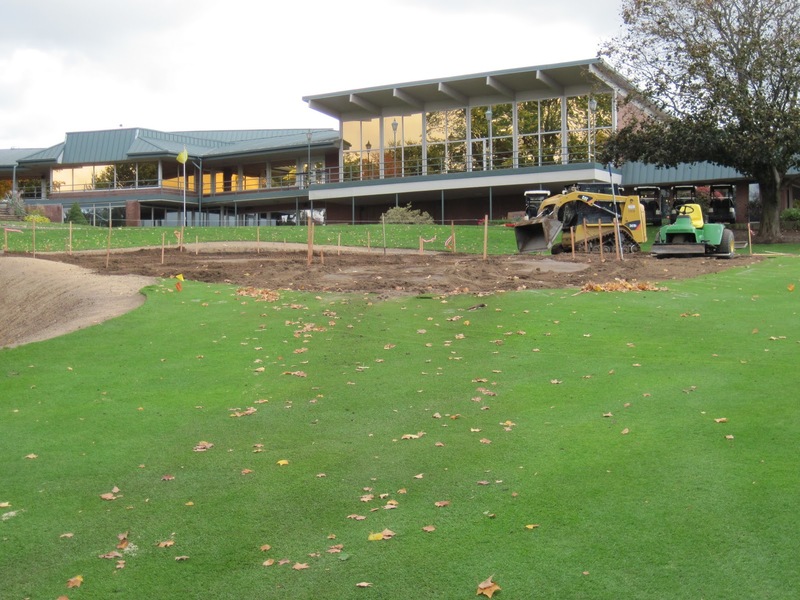 By the end of the day we had about 75% of the green sod down and nearly all of the new mow out areas around the green. It was an extremely long day, but well worth the effort by Ramon and his staff. Brian Yoder also made another visit to help with the project and to oversee the adjustments. Well, it was just a matter of time before our first minor set back. Today (Sunday) was our first, and hopefully last, rainout of the renovation project. We were able to get a few slope readings and some smoothing of the surface done before the heavy rain came, but it didn’t take long until the green became too difficult work with. Hopefully the sun and wind make a return trip to the area later today to dry things out so some sod can be installed tomorrow. With another slight chance of rain on Tuesday and Wednesday, tomorrow has suddenly become an extremely important day. need to be done again because of the rainout today. 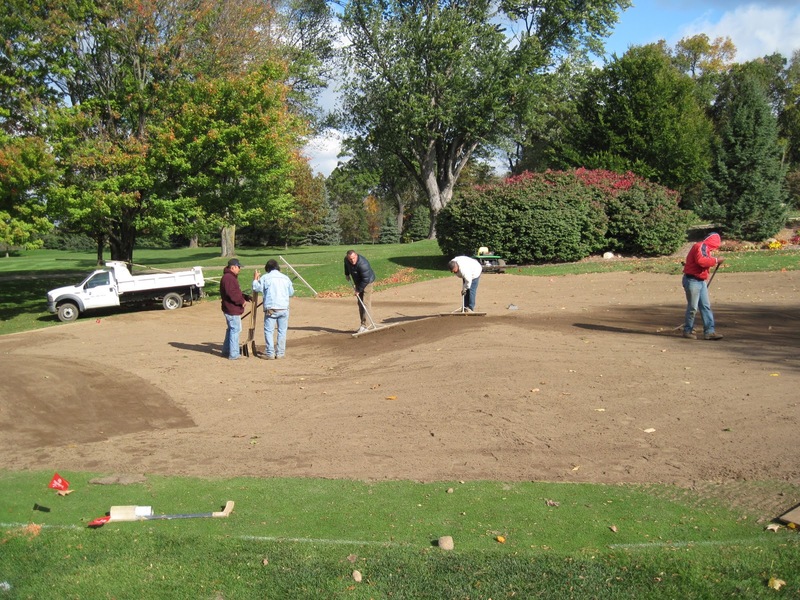 After another visit from Brian Yoder to review the final grade of the green, we are now much closer to putting the sod back on. 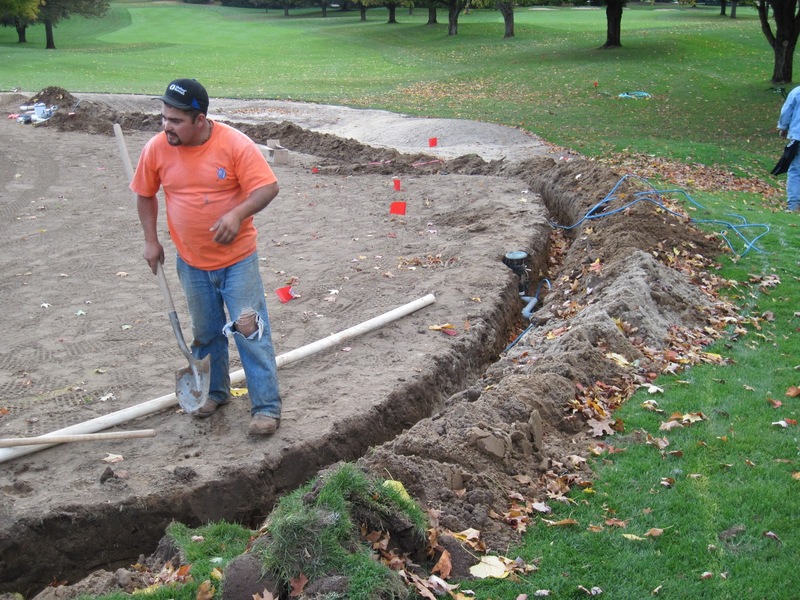 Today, a few minor adjustments to the contours of the green were recommended and a final shape was given to the bunker. Most of the day was spent putting Brian’s recommendations into place. 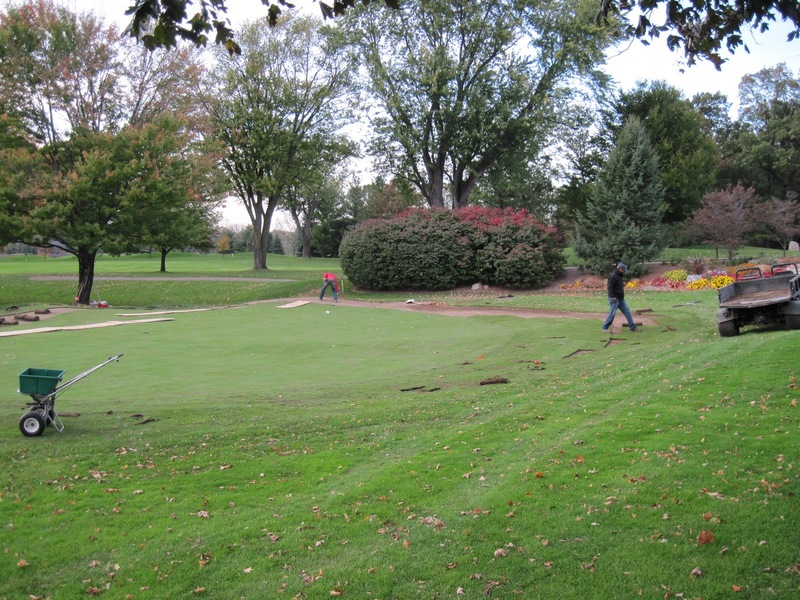 At the end of the day the green is now nearly ready for sod. 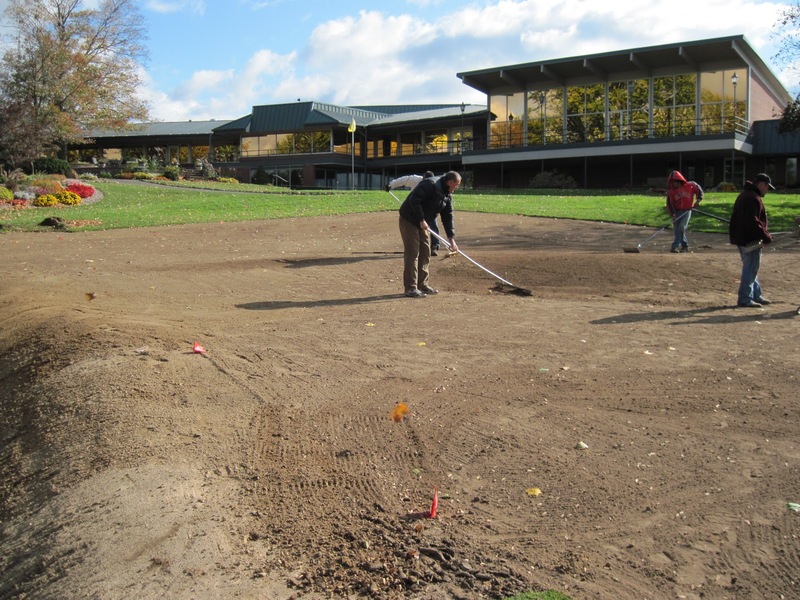 Some final raking by hand and another check of the slope percentages are all that need to be done before the sod gets replaced. Click on pictures for a larger view. that need to be made. Once again, another big step forward after Day 5 was done. 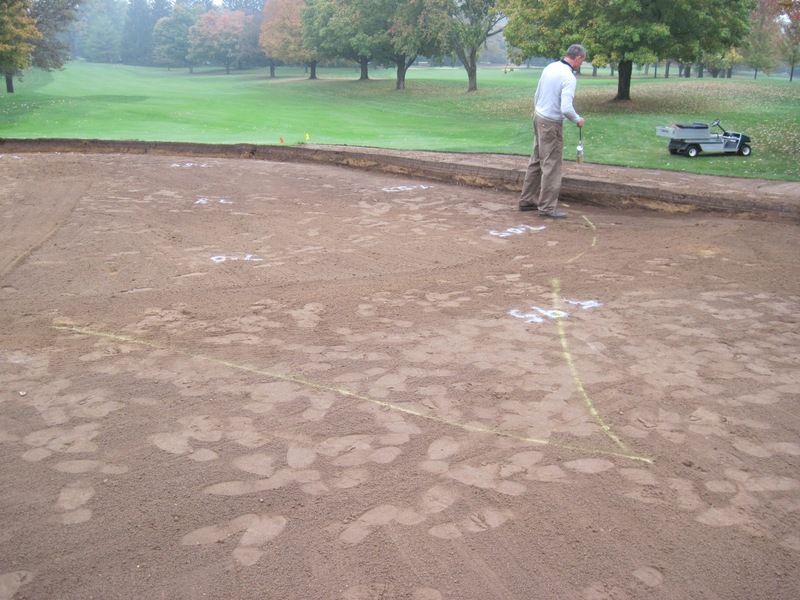 All of the rootzone material has been added back into the greensite and the final contours are becoming more visible. 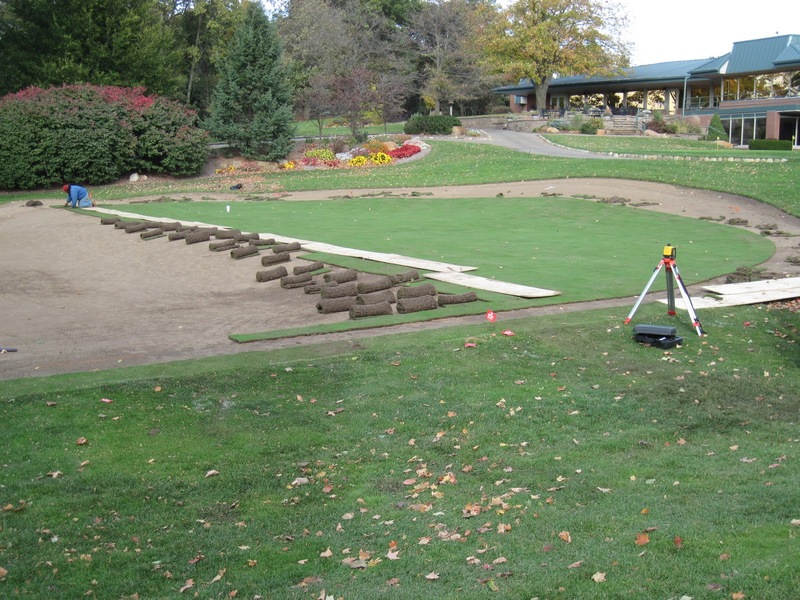 The irrigation has been re-routed and adjusted to work with the new shape of the green and the bunker is ready for inspection. 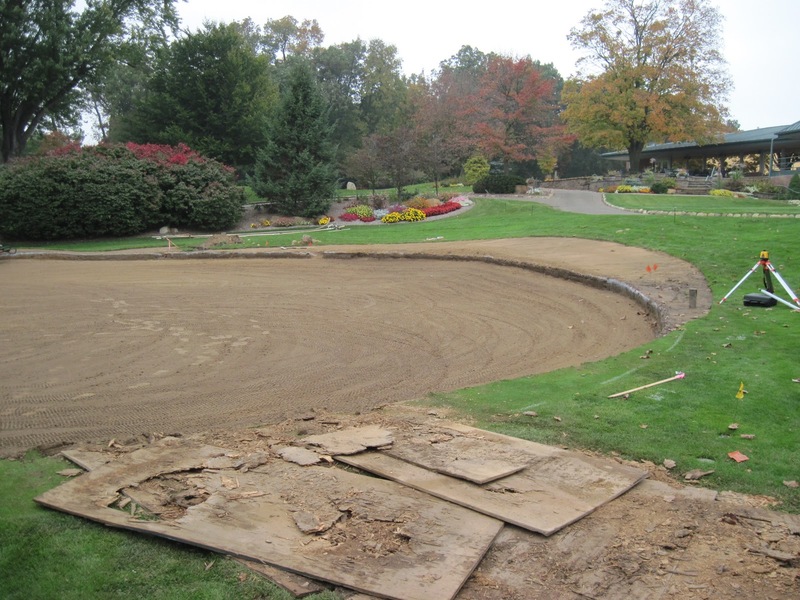 Brian Yoder will be back on Saturday to review the final shape of the green and make any necessary adjustments that he deems necessary. We do not yet have a projected finising date, but it certainly seems that they are well ahead of schedule. 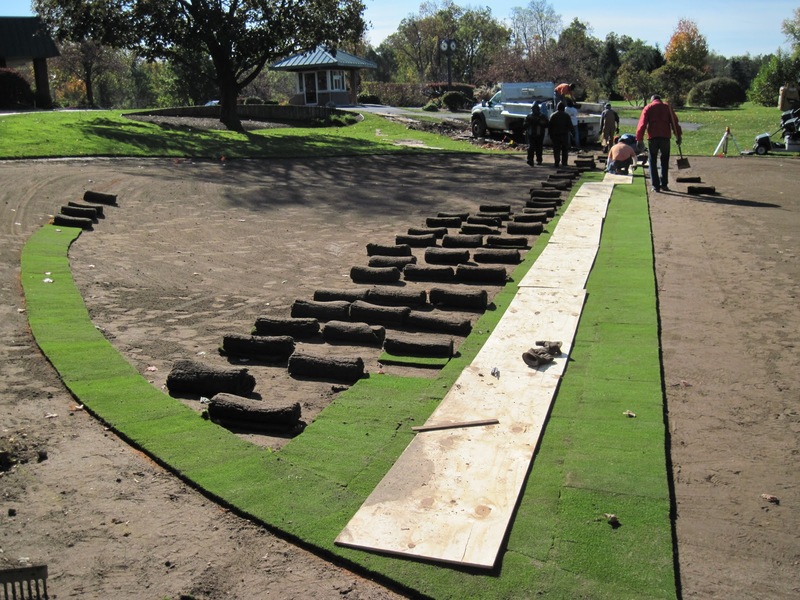 Depending on the recommended adjustments, we may be able to put sod on the green at some point this weekend or on Monday. 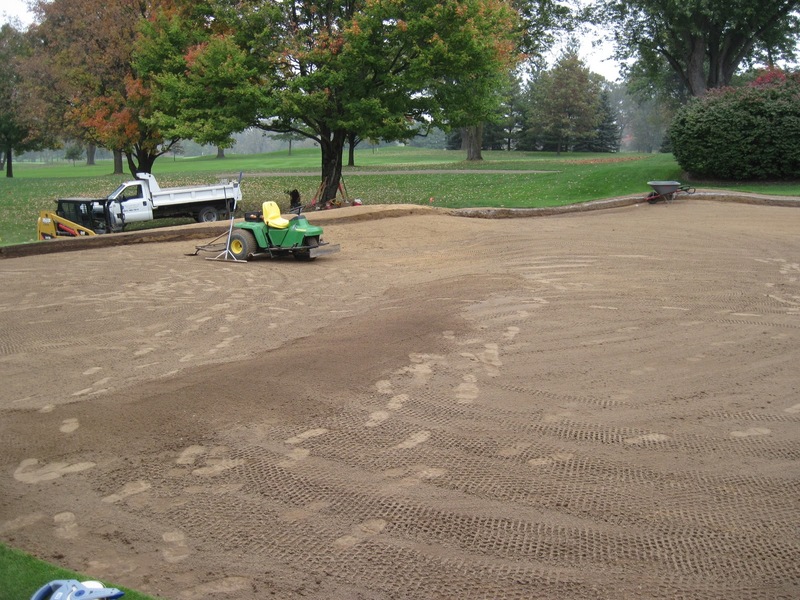 The bluegrass sod for around the new bunker and the bunker sand will be here on Monday as well. It is about to get even more hectic than it has been, so try to keep up. I will do my best to keep the updates coming. View from the front of the green. Much more of the green is now visible. Today was one of those days where it may not look like a lot of productivity occurred, but we probably took our biggest step yet toward reaching the next phase of the renovation. 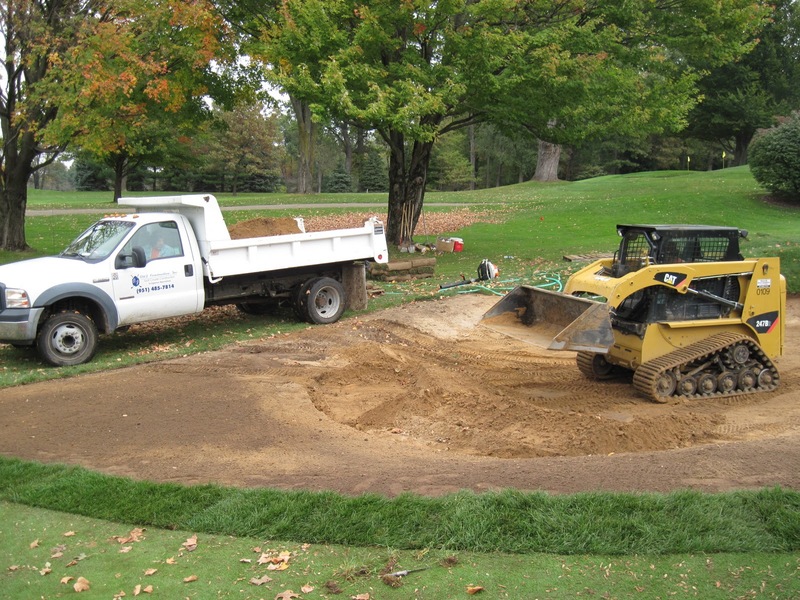 Coming into the day, the general shape of the green and bunker had been completed but had not been approved. 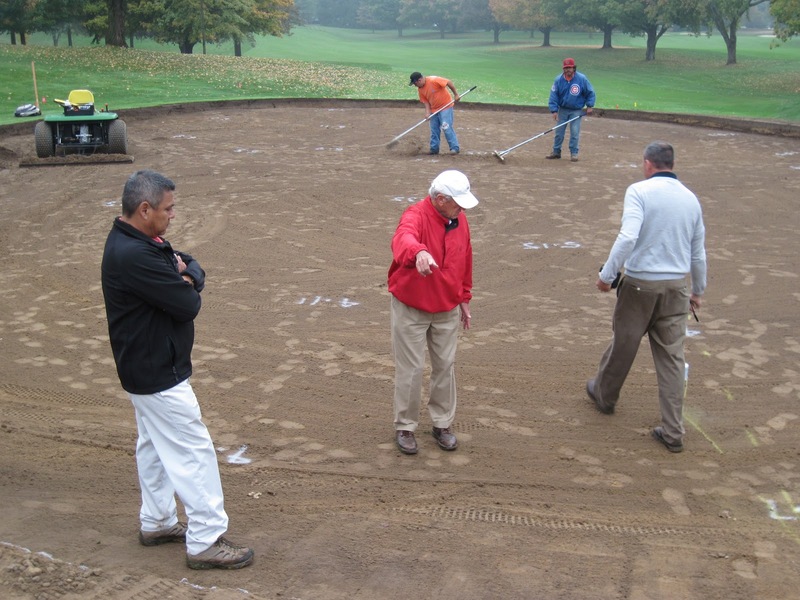 Mr. Arthur Hills and his associate, Brian Yoder visited the site to review the work and to make some minor adjustments. After the visit, there was a definitive plan for the remainder of the project. 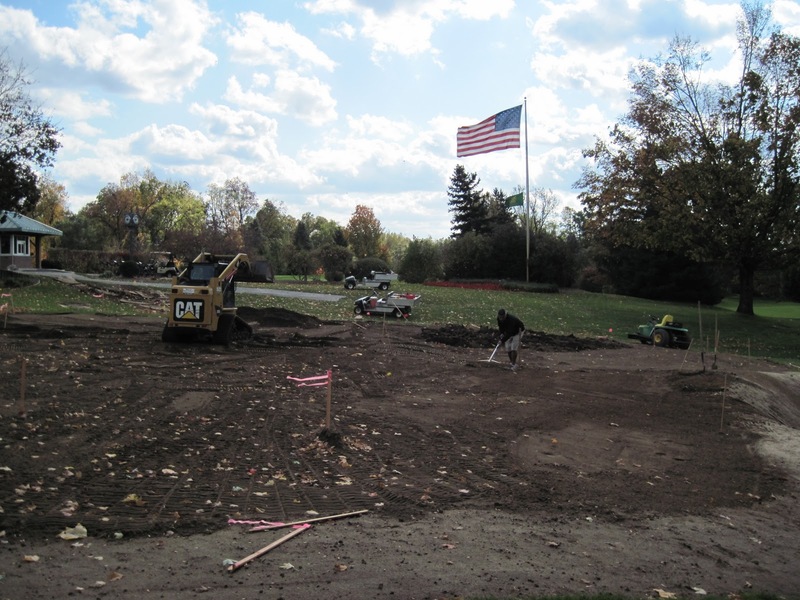 The green took shape right before our eyes as Mr. Hills and Brian Yoder seemingly waved their hands and added subtle contours to the green. 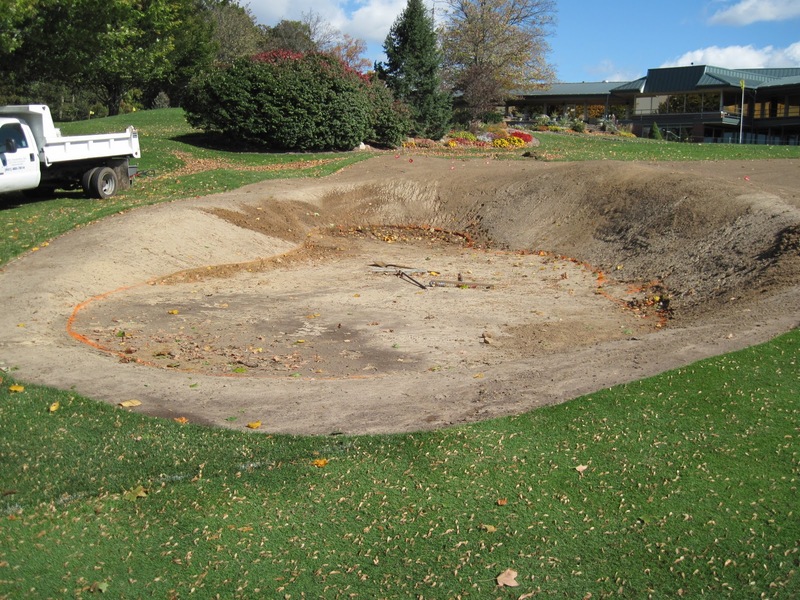 The shape of the bunker from Day 3 to Day 4 took a more dramatic change. The new bunker will be classified as a “coffin” bunker. It will have a flat bottom and only a slight amout of sand flashed up on the sides. 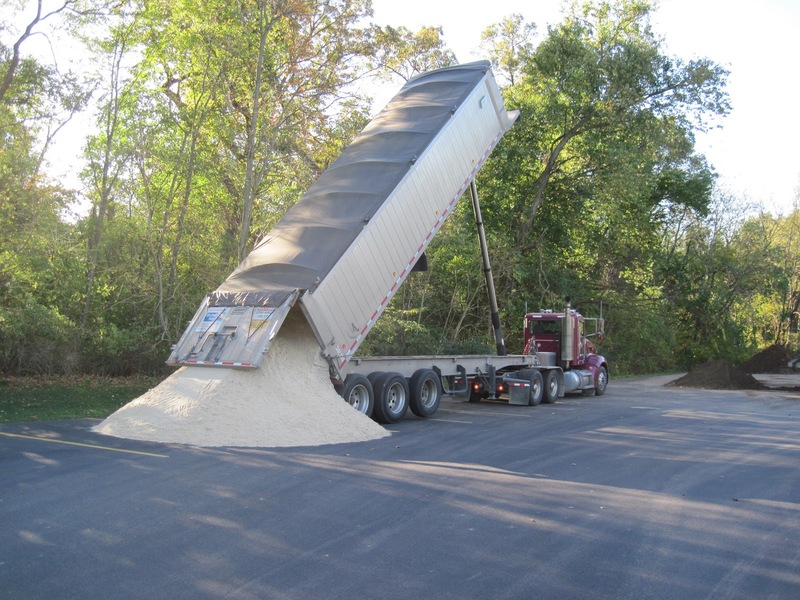 I am thrilled with this decision, because the threat of washouts has almost been eliminated. 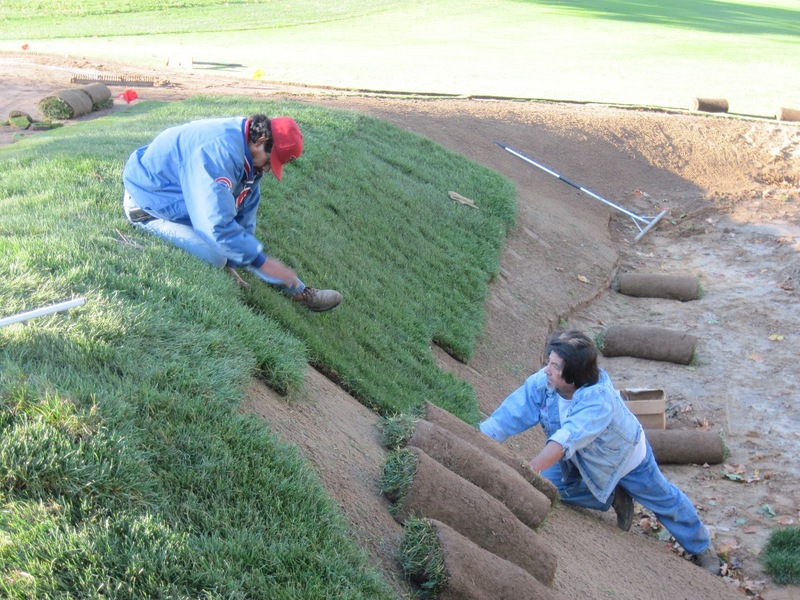 The grassed face of the bunker will be steep, but maintainable. 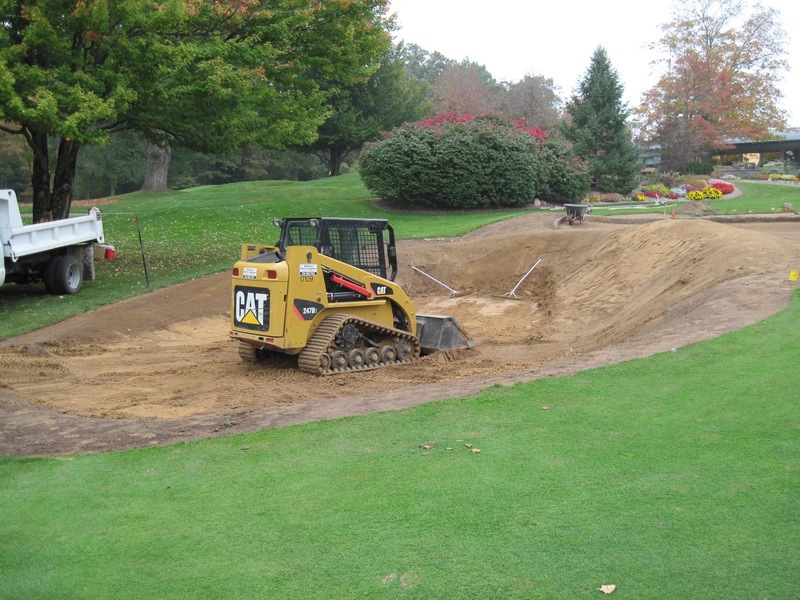 Make no mistake about it, this will be a very challenging bunker to go with an equally challenging green. middle of the tier (just like the old green). to want to be in this one!